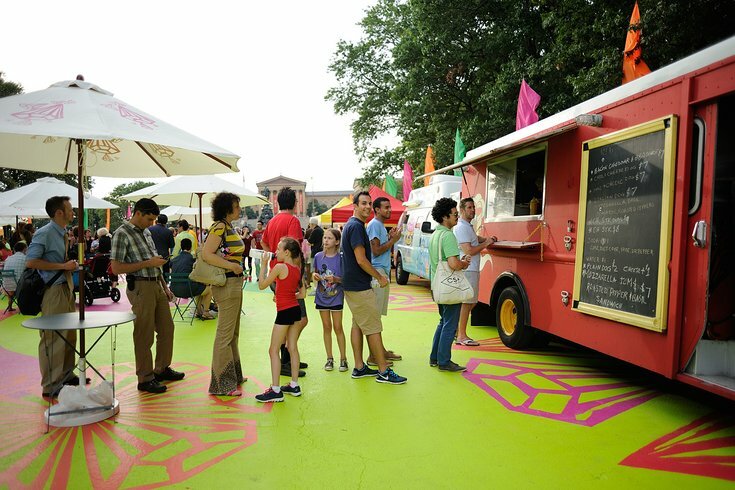 The Oval is a summer hot spot for food truck fare. UPDATED July 15: The Oval has postponed its opening day activities until Thursday, July 16 due to inclement weather. Activities will resume Thursday at noon. If you saw "Future Sensations," the exhibit of interactive digital sculptures that lined Eakins Oval with light and color this spring, then it might seem strange that The Oval hasn't officially opened for the season yet. Despite what your Instagram feed may have told you, the space really opens with full summer programming Wednesday, July 15. This season, the ground of The Oval will feature new art by Baltimore-based artists Jessie Unterhalter and Katey Truhn. Called "Summer Kaleidoscope," the art features bright, geometric shapes perfect for the happy, family-friendly atmosphere. Open through Sunday, August 23 The Oval will feature themed days of programming: Wellness Wednesdays, Arts & Culture Thursdays, Food & Flicks Fridays, Game Day Saturdays and Family Fun Sundays. Each day will include interactive games plus a rotating lineup of food trucks and a beer garden. For its opening weekend, the park has a few special events planned. Wednesday, July 15 face painters will be on hand from 5-9 p.m. and the Philly Sports Network corn hole league will play from 6:30-8:30 p.m.
Thursday, July 16 morning storytelling and live bluegrass music at night will be featured, as well as an interactive art activity hosted by Mural Arts from 1-3 p.m. and 6-8 p.m. The night of Friday, July 17 DJ Sonny James and Los Straitjackets will perform live, followed by a screening of "Pee Wee's Big Adventure" at 9 p.m.
Saturday, July 18 will feature the Vendy Award winners as the featured food trucks and Johnny Goodtimes will host quizzo from 4-6 p.m. The Free Library's Techmobile mobile computer lab, a mobile classroom and family-friendly karaoke finish out the weekend Sunday, July 19.